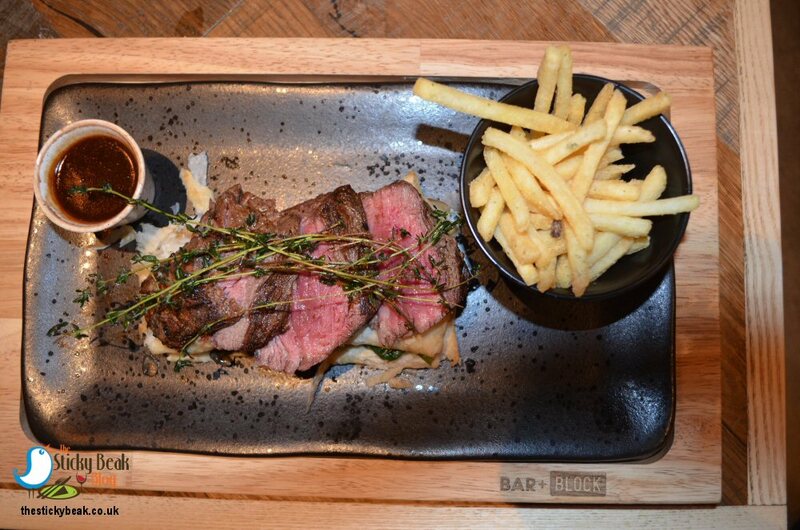 It’s always exciting when somewhere new opens, and Nottingham’s newest steak venue, Bar + Block is a mere few weeks old. 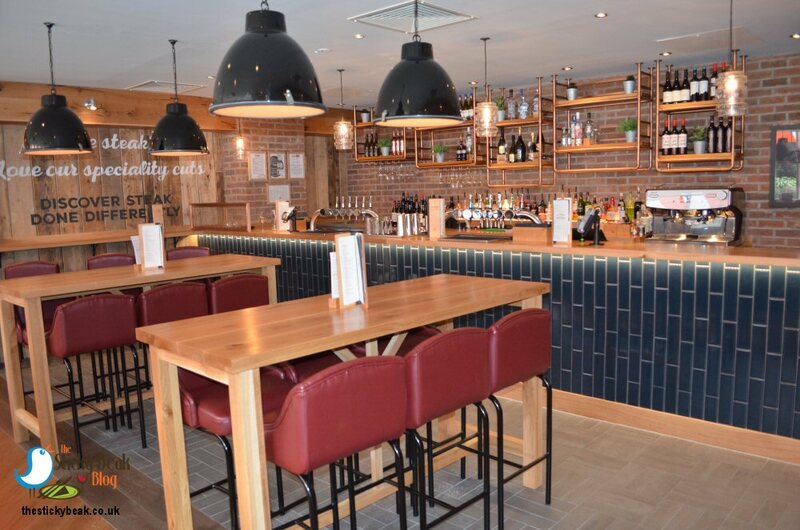 Having opened its doors to the public mid-June, the venue is already proving popular thanks to its huge range of steaks and other meat, fish and vegetable dishes. From the outside you can’t miss the premises; the vivid orange and white striped awning is probably visible from space! 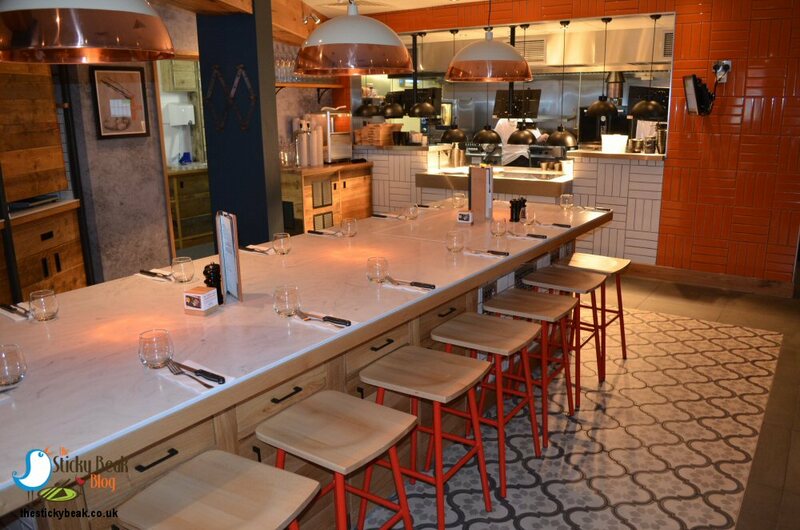 Inside it’s just as vibrant, both in terms of modern decor and the super-friendly staff team. 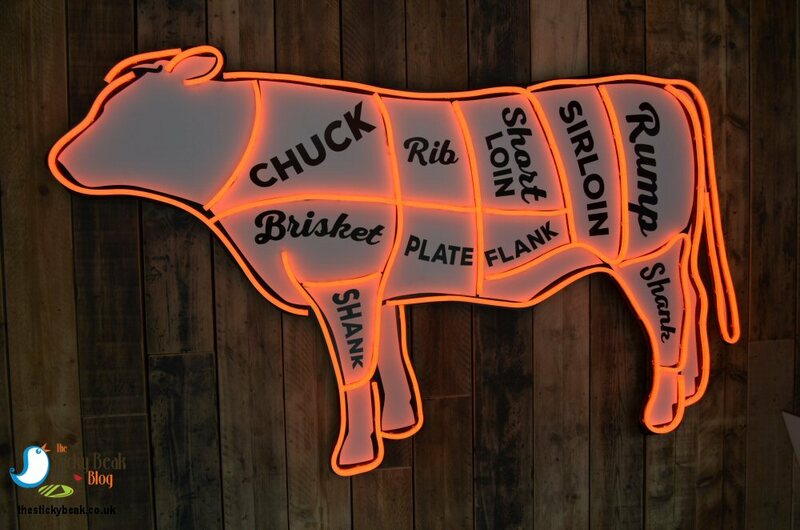 As you walk into the reception area there’s a trendy “Hello” sign in mosses and grasses hanging on the wall, and adjacent to that is a stylised cow displaying the location of the popular cuts of meat. Heading inside, there are fab wooden floors and tables that have black and tan-brown padded chairs to sit at, as well as plenty of booth and banquette tables. The show –stopper for me though is the “party table”; this seats up to 18 guests, making it the perfect spot for celebration meals. For those that love to pap each other, there is plenty of lighting above this table thanks to a trio of huge copper pendant lights. 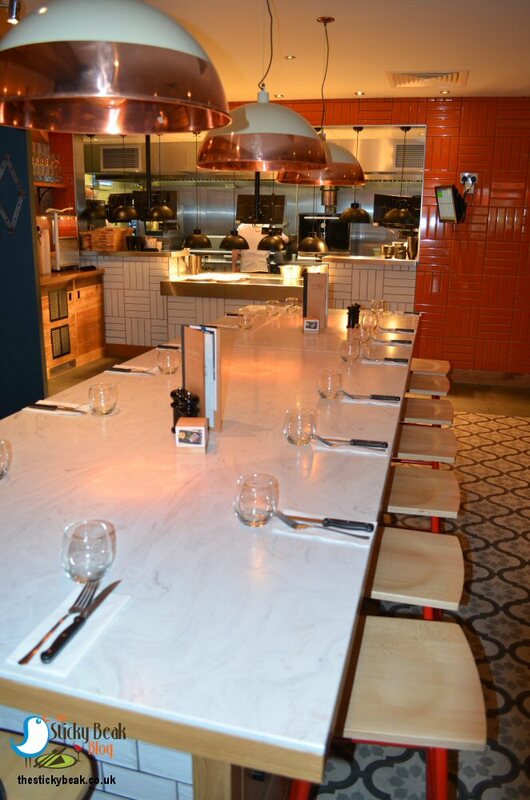 Right in front of the large party table is the open kitchen, and His Nibs and I were sat just to the side of it in a banquette booth; I love seeing all the action of a dynamic kitchen! Our server, Vivien, brought over a large bottle of chilled water and a pot of beef seasoned popcorn for us to nibble at, both of which are complimentary. The popcorn is gorgeous, and its rich taste got our juices flowing ready for the dishes to come. 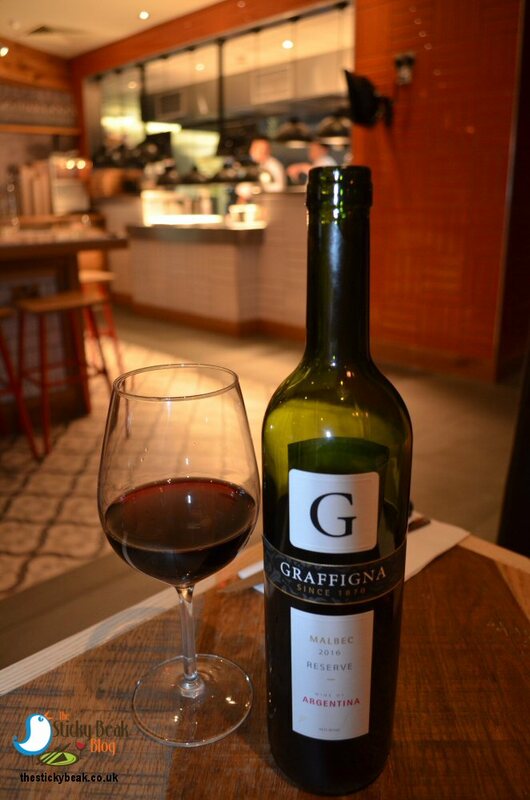 Rather refreshingly, the wine list isn’t pages and pages long; it covers the most popular grape varieties of reds and whites, with a rose and some bubbly options for good measure. I do enjoy a glass of Argentinean Malbec as you know dear reader, so I was pleased to see that were two options of this tipple on the Bar + Block list. We decided to go the whole-enchilada and have a bottle to share, and at £20.95 (the house wines are £14.95 a bottle) it is reasonably priced. Daniel, Bar + Blocks Manager, came over to say Hi and we took the opportunity to pick his brains about the starters. The “grazing plates” are designed to be mixed and matched, with 3 between two people being the recommendation. Oddly enough, The Man and I were thinking of just having a couple of them, but Dan persuaded us to double this; clearly my reputation as a glutton is spreading over the county border! 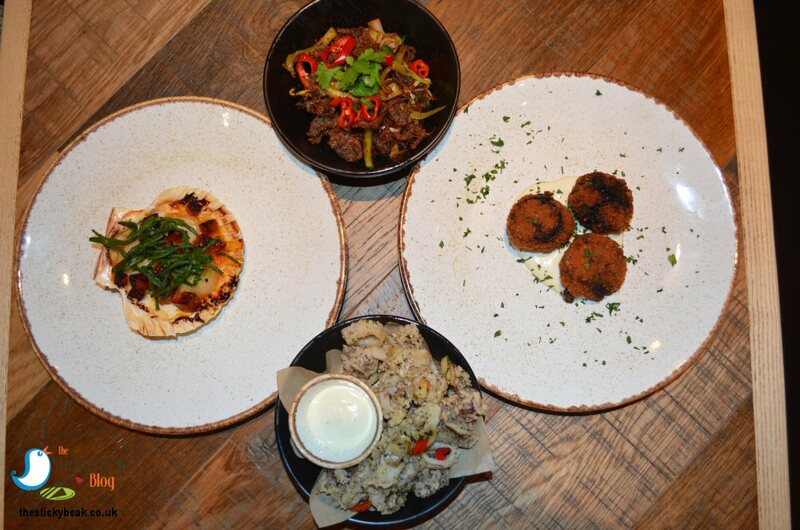 In the end we did order a quartet of grazing plates: Asian Crispy Beef, Salt and Pepper Squid, Atlantic Scallops, and Pulled Beef Croquettes. There was plenty of sizzling coming from the kitchen and the Chefs were hard at work; we weren’t the only ones in the restaurant, despite it being “hump day”. It wasn’t long before Vivien and another staff member, team leader Nevada, were bringing out all our starter plates – and boy did they look yummy! 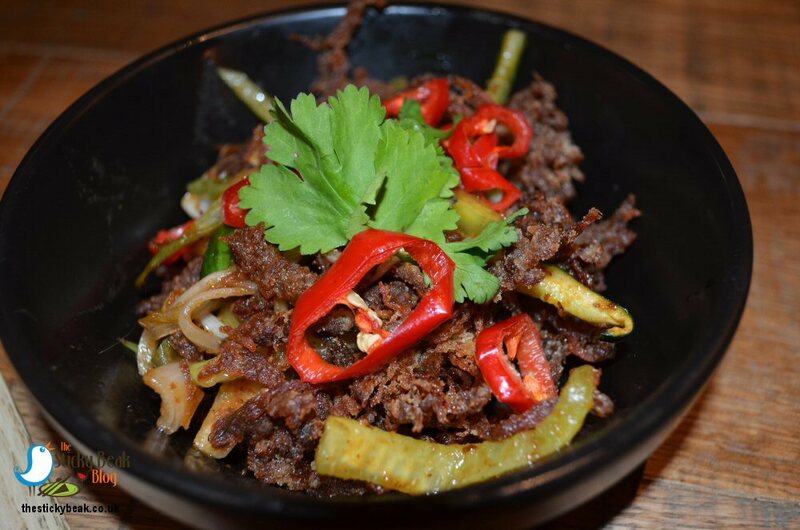 The Asian Crispy Beef is shreds of Hoisin-tossed pulled Beef and it really is a punchy little number thanks to sprinkles of fresh Red Chillies being present. There is a number of cooling elements in the dish, so don’t worry if you don’t like uber-spicy food, you’ll be fine; Cucumber ribbons, mild Spring Onions and plenty of fresh Coriander take the temperature down a notch. It was a tasty, colourful dish that both of us enjoyed a lot. 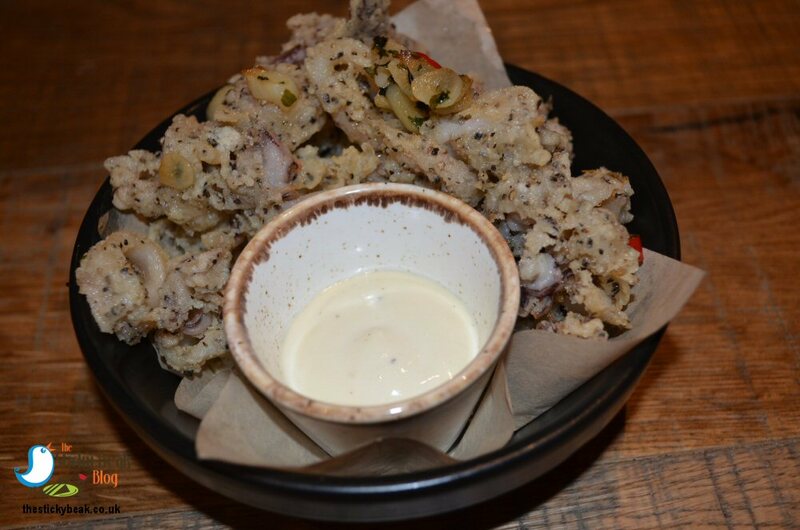 Salt and Pepper Squid is one of our perennial “go to” starters, and the Bar + Block version is really good. The dinky rings of Squid were beautifully soft in the mouth, not at all chewy, and their salt and pepper coating was wonderfully bright on the palate. There was a generous pot of Garlic Mayo to dunk them into, which we did with joyful abandon! Normally I’m fairly good at sharing but I must admit to doing my damndest to keep the Atlantic Scallops all to myself – not very successfully though. His Nibs has recently discovered a liking for them; the worst thing is that it’s my own entire fault for insisting that he try some of mine on a previous occasion. He liked them, to his surprise, and since then they’ve been fair-game to pinch from my plate; own goal scored there then Beaky, nice one gal (not!). The Scallops were brilliantly sweet, meaty morsels that were cooked in Garlic butter and chunks of Chorizo. 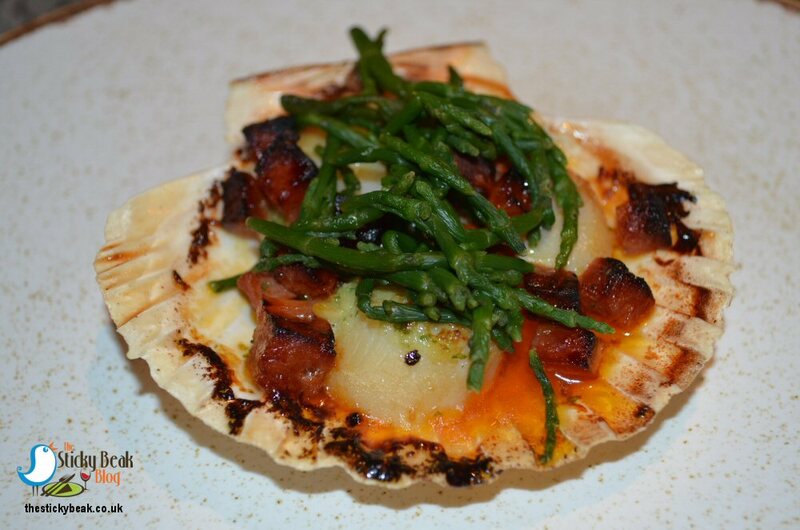 Salty Samphire fronds and the spicy Chorizo partnered the sweet subtle Scallops really nicely, resulting in a clever little starter that was light on the tum but had plenty of taste and texture. His Nibs had really fancied the sound of the Pulled Beef Croquettes and they didn’t disappoint. 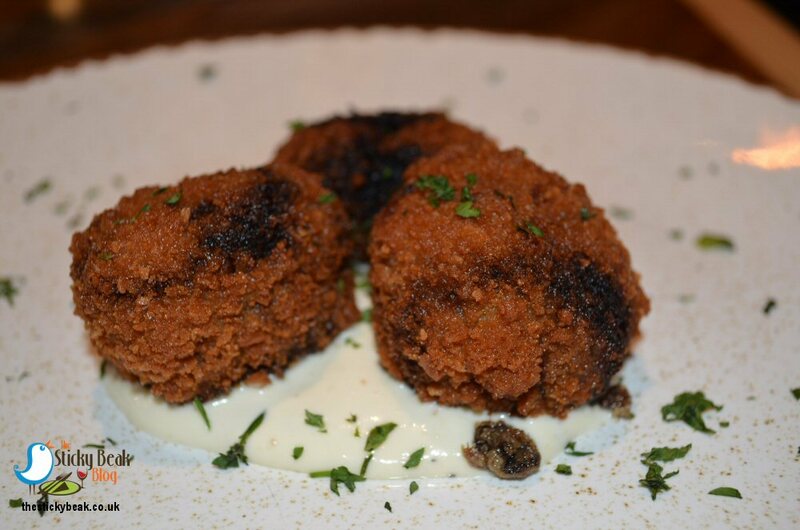 They are described as Croquettes filled with Pulled Beef that’s been marinated in a rich Port, Black Treacle, and Bone Marrow sauce, and they literally are just that. Full of juicy meat; no Potato to pad the centre out – just meat, meat, and more meat! Very filling and even more flavour-packed. With our appetites suitably whetted by the delicious starters, we couldn’t wait to taste the mains we’d ordered; Deconstructed Beef Wellington for me, Tira De Ancho for The Man. Both of these dishes are Bar + Block’s Specialty Cuts and come with either house salad or beef dripping triple –cooked chunky chips. I upgraded to the Parmesan and Truffle oil infused fries, it’s only 50p extra, and I just fancied them. All Bar + Blocks meat comes from British cattle breeds that have been reared “across the pond” on the South American Pampas. 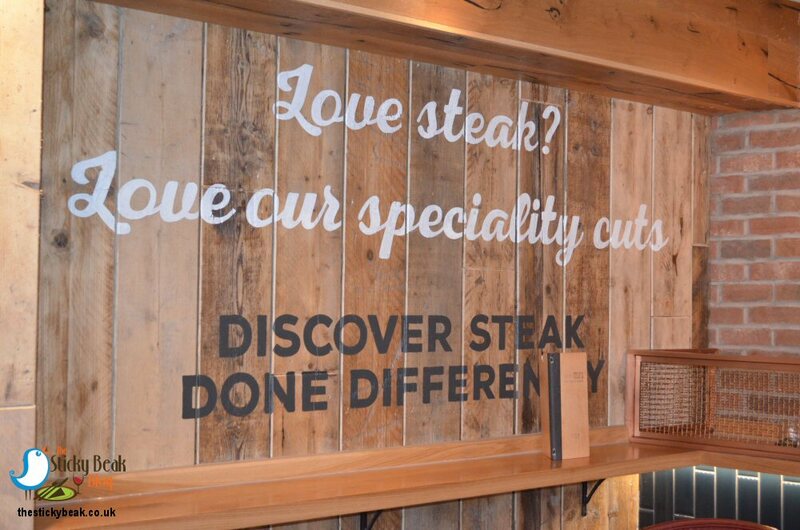 The meat is left to mature for at least 28 days and then the team hand-cut the steaks on site; you can choose from 8oz or 10oz classic cuts as priced on the menu, or discuss prices for larger steaks if you’re feeling extra-hungry! I had my Fillet cooked medium-rare, with the emphasis on rare and Chef clearly knew what I meant as it had been cooked just as I’d envisioned it. The fibres of the muscle could be discerned clearly, so I used them as a marker to cut with their grain; my reward was a silky soft, succulent, flavoursome bite every time. Between the two layers of buttery puff pastry were wilted Spinach and an assortment of mushrooms: Oyster, Shiitake, Chanterelle, baby Button, and Enokitake, all sautéed and softened nicely. A wonderfully rich Malbec sauce came with this dish, served in a separate little pot to add as you wanted. My Parmesan and Truffle oil infused fries were perfect! These delicately thin fries had a dusting of microscopically fine Parmesan on them which meant that the last mouthful tasted as good as the first, rather than the cheese just sitting on the top layer of fries. The Boy Wonder was singing the praises of his perfectly medium-cooked Tira De Ancho, revelling in its rich, deep, meaty taste. This dish was incredibly juicy and tender; the marbling of fat had softened and permeated the entire steak, making it superbly moreish in the mouth. 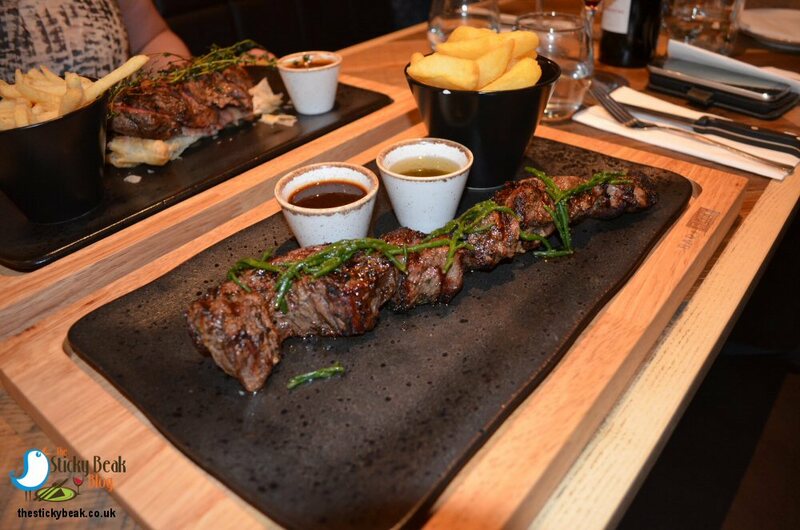 Chef had seasoned the outer of the steak to enhance its flavour, and the salt hint was picked up rather cleverly by the Samphire garnish allowing the palate to really savour it. His Nibs does like a good chunky chip, and he also likes chips cooked in beef dripping; needless to say, he became a huge fan of the ones on offer at Bar + Block! These monsters had great crunchy outers, and lovely soft inners that melted on the tongue. They also dipped beautifully into the herby Chimichurri that came with the dish. To accompany his Tira De Ancho, The Man had selected Bar + Block’s signature sauce – the Fiery Black Sauce. This tangy, spicy minx had a fab Worcestershire sauce vibe going on; punchy, but wasn’t going to blow your socks off or have you begging for gallons of water. 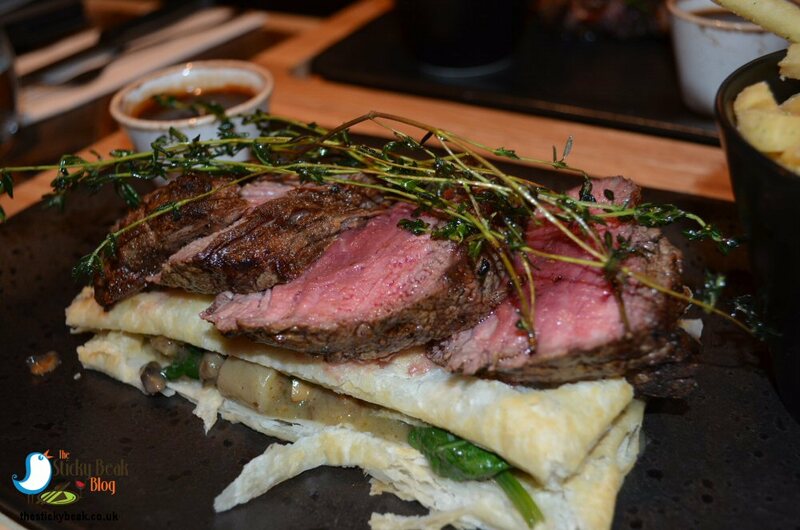 Its robust nature suited the Rib-eye cut of beef marvellously well. We always say that we’re not going to stuff ourselves and have pudding, but then we always end up having it; we simply can’t resist! The couple on the table in front of us were a course ahead in their meal, and I’d seen the Chocolate Churros Sundae go past – there was no way on this earth that I wasn’t going to have that bad boy!! So when Vivien came to enquire as to what we would like, I was faster than Usain Bolt in my reply (much to His Nibs’ amusement). The Man Bird plumped for the Mixed Berry Pavlova, and we sat back to relax with our drinks whilst pudding was prepared. 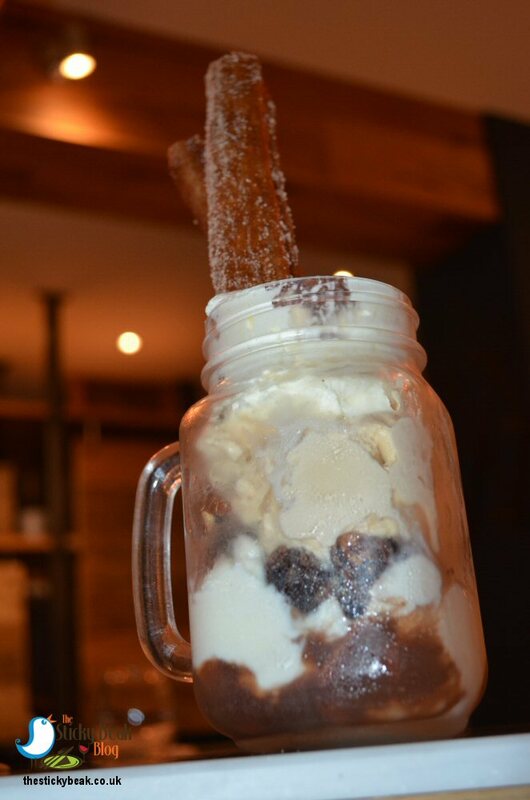 What can I say about my Chocolate Churros Sundae? I think “wow” says it all. The Cinnamon-sugar dusted Churros were huge, just about as tall as New York sky-scrapers I reckon! They sat majestically on top of scoops of Vanilla and Salted Caramel Ice Creams, amongst which were a multitude of Chocolate Brownie chunks and lashings of Chocolate Toffee sauce. A thick layer of whipped cream crowned it all, so it honestly did look like the Churros “sky-scrapers” had burst through the clouds, up towards the heavens. 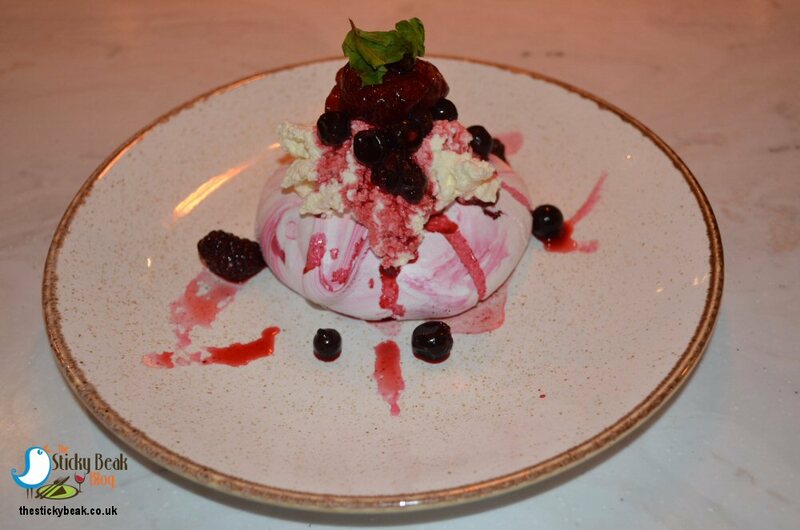 The Mixed Berry Pavlova was no less stunning with its delicately pastel-hued marbled outer. His Nibs was enthralled with the super-soft texture of the meringue itself, saying it literally melted like a snowflake on his tongue. A superb medley of Blackberries, Strawberries, and Blackcurrants provided a wonderfully tart contrast to the sweet meringue, making this a cleverly balanced dessert choice. It seemed as though we’d only been in Bar + Block for an hour, but a glance at our watches said at least double that; time really does zoom by when you’re having a great night! Our specialty dishes were on the pricier end of Bar + Block’s pricing scale; £27.95 for my Decon Beef Wellington, £25.95 for the Tira De Ancho, but both were well worth the money for the quality and quantity. 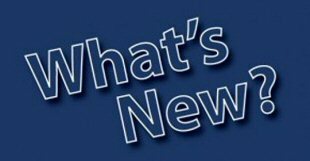 As a rough guide, grazing plates range from £3.75-£6.50, classic steaks £11.95-£22.95 depending on cut and size of steak you choose, and puds all at £5.95 except ice cream which is £4.50. Bar + Block do a selection of Burgers too, and these come in at £9.95 - £13.50 including fries. 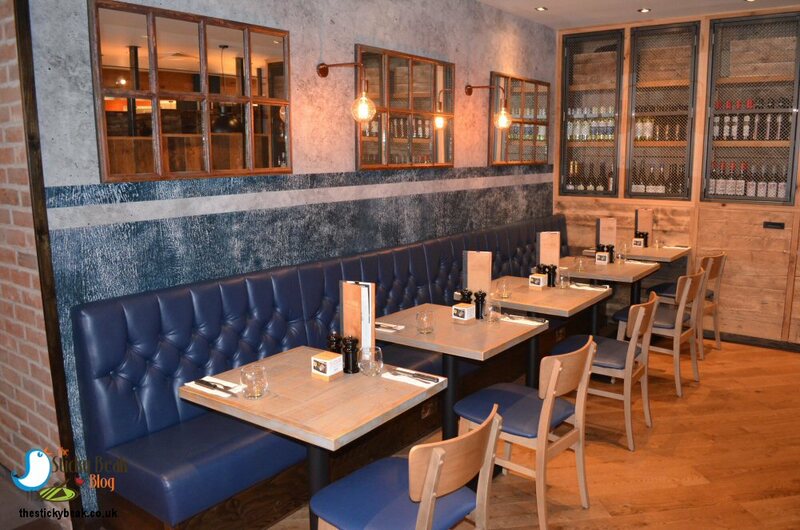 Fish and vegetable dishes are priced between £9.95 and £14.95, and the grill section ranged from £13.50 for Lemon and Thyme Chicken, to £19.95 for the massive Mixed Grill. Hot Wings awarded quite happily here, and if you love a good steak it’s a must-visit venue!